There’s no way to pinpoint the moment depicted in this 1980 card, but it seems that Terry Puhl is considering whether to try for the next base or return to the one he’s already crossed. His body language seems to suggest that he’s leaning toward a cautious return rather than a gutsy, barreling, Enos Slaughteresque assault on the extra base. Why take chances? Proceed with caution, avoid mistakes: It’s the proofreaderly way of Terry Puhl, who years after the last of his many error-free games is still the all-time major league leader in fielding percentage for an outfielder. When I was a kid Terry Puhl was my favorite Astro, which was particularly significant because in the late 1970s and early 1980s the Astros were one of the three National League “mistress” teams that I rendezvoused with periodically in my mind to ease the pain of my marriage to the Boston Red Sox, a marriage that was going through a particularly sour and disillusioning period. The other two teams were the Expos, who played as close to my Vermont home as the Red Sox, and the Mets, who I got to see every summer during visits to see my dad in New York. The relative proximity of the Expos and the familiarity of the Mets explained those two extramarital dabblings. As for the Astros, I suppose I was drawn to them because in their blindingly bright uniforms, in their faraway location, and most especially in their style of play they offered the complete opposite of the gray, slow, plodding, fatally flawed, all-hit, no-pitch, Last Days of Yastrzemski Red Sox. 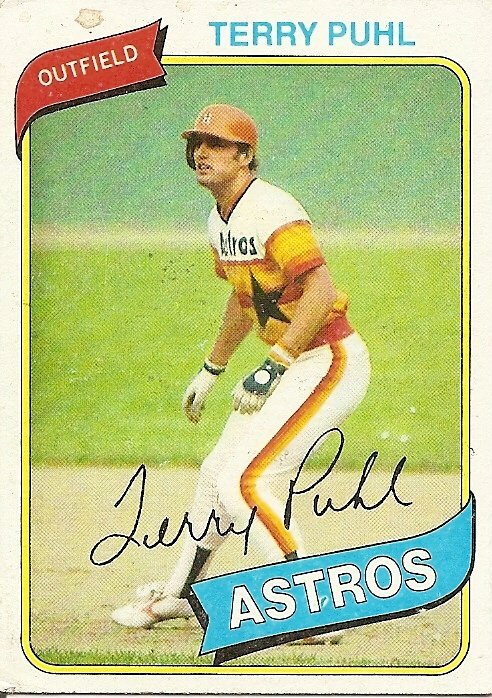 But for some reason among all the rainbowy tripling Astros I liked the somewhat colorless Terry Puhl the best, and I’m not at all sure why. He hit for a good, but not great, average. He had some power, but not really that much. He stole some bases, enough to have easily led the trudging Red Sox but not nearly enough to make a mark on the league leaders, or even to put him past the top two or three guys on his own team. In 1980 I got my first set of Stratomatic cards, so I began to appreciate that he was also a good, but not great fielder (an above-average “2” in both left and right field, an average “3” in center, with a decent but unspectacular “0” throwing arm), and that he of course hardly ever made an error. He was, I don’t know, the epitome of being pretty good. I don’t know why I would have gravitated toward that. Don’t most kids idolize either superstars or oddball Shlabotnikian benchwarmers? I’m not saying Terry Puhl was my favorite player in the world, because even though my love for the Red Sox had become at best complicated and at worst a joyless march of obligation I still loved them above all else, but in the buoyant fantasy where the entire Red Sox franchise from the remnants of the Yawkey family on down to Gary Allenson and the batboys tragically crash-landed into the Himalayas, leaving me a sports-team widower, Terry Puhl and the Astros would be there to help me learn to live again. It’s possible I gravitated toward Terry Puhl because I was a very cautious kid. Maybe I’ll write another novel about my childhood someday and call it Portrait of the Proofreader as a Young Man. In it you’ll see me on family downhill skiing outings where my older brother skis fast and wipes out often while I avoid the expert slopes and snowplow down the intermediate hills, crouched and stiff like Terry Puhl on the brink of deciding not to press his luck, as in the above photo. You’ll see my brother at school and elsewhere getting into arguments and fistfights and occasionally even talking to girls and beyond that once in a great while getting to kiss them while I stick to the fringes and gradually master invisibility. The book will open when my brother and I are both very young, the day my brother gets hit by a car and breaks both his legs while running for an ice cream truck. I’m told I was there watching, but I don’t remember this. Maybe it’s one of those repressed memories. If that’s true it may explain in part why I have often retreated to the safe base to wait for someone else to make something happen. You are currently browsing the archives for the Terry Puhl category.